Not now, especially not now. Not when I just made up my mind to be a better one.. its barely the new year and yet I'm already eating my words on a promise I recently made. Don't complicate things! Don't tangle me up in YOUR web.. don't make me hate and loathe you.. especially when I just got what I wanted. Don't turn me into a monster. Don't spread your negativity to others, I have my own negativity to battle with so don't add yourself up in my list. Just because you think you'll always be seen as the victim, don't turn everything into a drama. I've got my own soap opera I have to go through everyday so DON'T force me to be part of yours. I don't have the patience for all that. There's only room for ONE drama queen in everyone's life, don't be my second! I can't ask you to leave me alone. Its not my place to do that.. but please don't do this to me. You're free to do what you want to do so don't complicate it. Don't involve other people, don't turn a simple thing into a big problem.. just don't! I don't wanna hate you.. heck! I'm trying to shorten my "I hate" list even as I'm typing so don't let me start the new year with a new addition the the list I've been trying to eliminate. Don't make me question your actions.. don't make me suspicious of you. It'll be bad for me.. and will be worse for you in the long run..
..just don't turn me into a bad person! I'm doing a good job of that pretty much on my own so DON'T be another catalyst for it..
A student of mine got hold of my number. Didn't actually care much about it except the part where he refused to tell me who he was. Ek elehh.. It wasn't as if he was sending me messages I'm not comfortable with, in fact, I really like him. Punye la banyak soalan dia nak tanye, the kind of student of every teacher dreams of hehe.. its just that, I felt weird teaching someone 'invisible'. He kept avoiding my question on who he was and when he refused to answer, lagi la my curiosity rocketed up to the sky la kan. Punye la susah nak bgtau name dia. He kept replying, "Sy malu la cikgu.." Haha, malu ke bende, takde idung ek? I kept telling him I won't teach him unless I knew who he was but in the end of course la I 'succumbed' and just taught him how to answer the questions.. huh, degil sungguh student ku ini! Then one day, when he smsed me asking a question, I told him, "Awk takmo jwb soklan sy, sy pun takmo jwb soklan awak.. so jwb dulu, baru sy ajo.. klau tak, tunggu kelas esok je!" I got this as the reply (spelling included): "Sy asal Sg Buluh.. Ada 4 sibling, sy ada ayah n mak.. Ayah n mak sy bek tau.. sy cuti g 2sen.. ambik math.. ckgu sy Nurikhwani Idayu.. dia bek tau..dia nk tlg sy b4 SPM.. smlm tlg.. Alhamdulilah buka gak ati dia.. tp arini.. aduh sedih la.. ckgu sy ni ske Nescafe.. k sy da jwb dah.. ckgu jwb soklan sy pulok :D"
Went back home kan aritu and went out with Mama, Umi, Izati, Annisa and Irfan. You see, most people know how annoying I am when I drive. Suke sangat nyanyi, macam la sore sedap hehe.. So once upon a time ago, while taking Annisa for a drive, as usual la, I sang. Know what she did? She closed my mouth with her small hands saying, "Kak Yong jangan la nyanyi.." while frowning! Ciss, ampeh je budak kecik tu.. Izati punye gelak guling² cakap, "Budak kecik pun tau sore kak Yong tak sedap.." Haha..
Then, mase kuar with my family, Izati had switched on some songs on her phone and though I wasn't driving, dok nyanyi gak la with her. This time, Annisa ignored me. Bosan kot dia, kak Yong dia ni asyik tak paham bahase.. But then I felt some eye 'boring' into me and when I looked around for the 'source', I found Irfan frowning at me.. Aik?!?! Last night pulak, I was reading one of the books I had just bought.. "Goodnight Beautiful". Still halfway through but I like it though its kinda 'sedey' for me. Before I fell asleep, I came across this chapter where the Mal was telling Nova (the surrogate mother of his and Steph's child) Goodnight beautiful.. So when I put the book back on my shelf, mule la berangan, "Sape la nak cakap camtu (beautiful) kat saye kan?" Then suddenly the incident a few days ago came into my head, and though I was still reeling from 'the ringing words in my head' that have upset me the past few days, I found myself laughing out loud..
Adeh! Baizurah, tolong saya hahaha.. and Ina, Bart Mak Su jugak haha! Seriously, I shouldn't be teaching that class again next year haha..
Well, the new year is just around the corner, so its time to change and be a better person.. Go! Go! Ayu heheh.. Spent half a day with my lil sister and brother. Izati la ajak, nak tengok adik and Annisa was up and ready from early morning upenye. Izati went with Mama while I went there straight from my 'appointment'. Umi had taken the day off and Abah was no where in sight hehe.. so it was just the 6 of us. Took the lil ones to the playground and it seemed that the two 'older ones' pun jadik budak kecik bile layan diorg nih hehe.. This is Irfan btw, comot giler minum air tumpah², makan fries cicah with the dirty soil at the playground.. euwwww..
Got a picture of Annisa but its in Izati's phone, lupe nak transfer. Then we went to Jusco Bandar Perda. 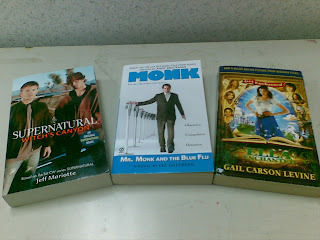 I bought my 'teaching aids' for next years class but I'm not putting them here, just in case my students find my blog again, and know whats in store for them next year hehe..
And btw, am expecting three more books from Wanie Books Galore hehe..
Next year plak I have class everyday (bully tul!).. Ok, ok.. haha, I'm not actually complaining pasal my class.. but if they could just relieve me from teaching form 1 and form 2 this year, kan bes..
Nanti malam dah tak free.. camne nak berpoya² :p Hehe.. berpoye aje Ayu ni hehe.. But seriously, nanti tak leh nak buat 'secret mission' dah ni.. *wink²* Not that sekarang ni selalu buat pun, memasing bz kaaaann..
And yup, the 'incident' smlm tu pun made me smile la jugak haha.. But for totally different reasons la kan! Thank God I have supportive friends who pull me back on the ground bile I dah melalut cam semalam haha.. Love all of you --> Bai, Bart n Mak Su! Layan je ekkkk heheh.. Lets talk about yesterday. Smlm was the birthday of a friend. I promised him a Sg Ara mali cake so Sunday evening found me caught in the jam on the Penang bridge. Mak aiiii, from 8.00pm to 9.45pm still on the bridge, and the bakery closed at 10.00pm. 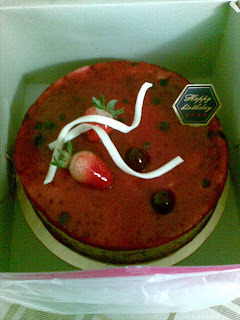 Sib baik sempat, managed to arrive at 9.55pm.. so here's the cake! Ain't she a beauty hehe.. rase pun sodap! Then pas berjaye pick up the cake, went to kak Wahid's. Yun nak anto potpourri for kak Wahid's wedding in January and we received her very nice invitation. Alaaaa, tak amik gambo la pulak.. lupe.. tp cantik, wpun Yun kate, "Nape cam kalender?" Hehe.. Arrived back home kul wape tah pastu layan Yun tengok Stomp The Yard until we fell asleep. So yesterday tu bz with class but before that sent the cake to my friend and gave him the present yang sangat tak sabo nak bagi hahah.. w/pun diriku dikatekan kejam, tp ok whaaaaaaaatttt! Hahah.. proving a point has never been this much fun! Malam plak gi school right after class to finish up a few tasks and otw home, my phone rang with a very familiar ringtone. Tp tak sempat angkat since my baterry yilek! and I got another pleasant suprise of the day (aside from the choc from my student, Nazreel) when the birthday boy sent his home-made cheesecake. Dia buat sendiri oooooo.. Heheh, ade ke dia yang buat, patutnye orang la buat utk dia kaaan hehe.. Ni sumer Mas nye pasal la ni. 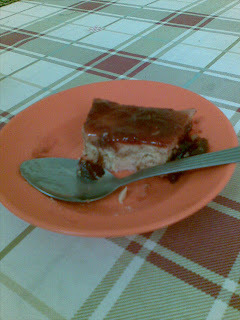 eversince she posted her cheesecake recipe, sumer staf Awam pakat nak buat heheh.. thanx Mas! Akak dpt cheesecake trus mlm smlm sbb Mas nye recipe :p So here it it, wpun dah makan more than half before terpk nak amik gambo hehe.. sedap wooooo! This morning I had a nice suprise when one of the boys in my class yang paling tak suke dengar cakap, paling tak mau buat keje, tetibe gave me some chocolate he bought from Langkawi. Terkejut gak, tak sangke dia ingat kat cikgu dia time cuti² and for today at least, wpun dia tak buat keje, he actually paid attention when I grilled Hazril on 2 questions.. boleh tahan la. Diorg ni bukannye tak pandai, tapi main banyak sangat. Then this afternoon had the 'hellish' class I never look forward too. After the 'mulut capoi' incident with one of the boys, I was determined to be a bit more strict with them today. So dari awal kelas, Teacher Ayu memang garang. Klau Zarul ade, kompen lagi dia suke panggil cikgu dia 'skuad leader'.. My voice was louder than usual, and I didn't smile as much. Tak mo bg muke sgt, kang di cakapnye bende bukan² lagik dengan selambe je.. ade ke patut saya yang malu, diorg tak malu pun cakap bende camtu..
Bile diorg dah perasan I wasn't in a good mood, baik la jugak diorg ni sikit. Sikiiiiiiiiiiit je la tapi sikit pun jadik le. Then suddenly, a girl in my class fainted. Sebenarnye with the girls I don't have any problem tapi sebab tak mo the boys kate pilih kasih, dengan the girls pun I was strict so bile the girl fainted, tetibe rase giler punye panik..
Jumpe kerani, and we called her parents. And believe it or not, AYU TAK BERANI NAK MASUK KELAS! There I was, berdiri je kat luar tu, without an ounce of courage to enter the class. Luckily all the girls helped the fainted girl but ME, THE TEACHER, stood behind the door and didn't even manage to force myself to enter the room. Ya Allah, cikgu ape Ayu ni?!?!?! Tatau kenape.. and I felt guilty sebab hari ni garang sangat AND sebab I couldn't bring myself to face her..
Last night, went to kak Chah's to give her Din's wedding gift. I don't think I'm going haha.. tadek gang la, malas gi sorang, dah la tatau jalan. Anyway, besa la perempuan, bile jumpe je nak sembang. Mau plak dah lame tak sembang with kak Chah and since we had 'mutual' students @ Jawi, ade je la topiknye (ditambah plak ngan I dok ngutuk my students kat Pt Buntar.. forgive me, tp melampau la diorg.. ade ke cikgu yang malu, diorg tak malu pun ckp bende a 16-year-old shouldn't be talking about!) Then kak Hafsah came back (she lives just across kak Chah) and joined in the sembang². Seriously felt like the makciks who like to gossip petang² kat gate umah hehe.. Anyway, kak Hafsah told me I got yet another parcel and reminded me to go pick it up at the office tomorrow..
..which bought me to the office this morning. Asking about my parcel, kak Sue suddenly beckoned me to go towards her while kak Zue was blinking her eyes repeatedly (hahah.. as someone who doesn't wear make up, of course la Ayu tak pasan dia nak tunjuk her new eye make up courtesy of kak Sue) And before I knew what was happening, kak Ros sat me down on a chair and wheeled me towards kak Sue. Knowing what was happening, Ayu dengan pantasnye meutup muke dengan tangan sambil menjerit, "Tidaaaaaaaaaaaaaaaakk.."
Hahah, okay, the drama above didn't actually happen la, but I DID cover my face with my hands while 'they' ganged up on me haha.. Jahat nye kate they ganged up hehe.. but cam tu la, kak Ros, kak Hafsah, kak Sue and Wan. At last, I relented.. tu pun sebab kak Sue kate, "Kak Sue nak buat mata hang jaa.."
Tapi kak Sue tipu.. uwaaaaaaaaaa..
And my 'virgin' face di'cemari' full makeup within 10 minutes. At first she did the eyes ("Kak Sue, awat lama sangat? ", "Ayu, hang dok diam sudah!" <--kak Sue garang hehe..).. pastu seronok plak dia nak buh bedak ("Ape buh bedak plak ni kak Sue? "), then eyeliner ("Ayu, hang jangan bukak mata sampai aku suruh hang bukak.. kang comot! "), blusher (time ni kak Sue dah naik sheikh.. erkkk.. hahah..) and Wan tukang buh lipstick. Ya Allah, rase berat muke.. and rase cam budak² main makeup mak hahah.. When they asked me to look at myself in the mirror, I refused! Haha, rase cam sangat malu and really wanted to wash my face. Wan tanye, "Camne nak makeup time kawen ni nanti?!?!" Ayu dalam hati, "Tak yah makeup langsung!!" And I had actually planned to join the tazkirah downstairs before going to the bursary to pay my fees.. tp sebab tadek sabun basuh muke, terus berkurung kat bilik postgrad.. adeh! Uwaaaaaaaaaa, saya mane reti laaaa.. Anyway, just came back from the ladies. Tau saya basuh muke ngan ape? Ngan hand washing liquid dlm toilet tu hahah.. tak sempat la nak balik umah basuh muke. And jugak, TAK MO kuar school camni hahah.. Moral of the story: Lain kali nak masuk opis, kene bace Bismillah banyak² hehe.. Yesterday, something wonderful happened. Ok la, not actually happened to me la, but a realization of something gave me this wonderful feeling..
As said in my previous entry, I'm teaching form 4 going on to form 5 students. In one of those classes, I have 2 'old' students of mine who took my class in form 3. One is Miss Aiman bt. 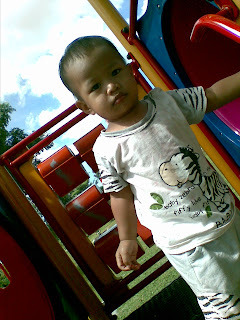 En Shah hehe.. and the other is this boy who shares my name. Now, this boy when in form 3 was the type who'd frustrate me now and then. I know, I know.. as a teacher, I shouldn't be like that but I can't help it. Matters became worse when I myself admitted defeat in the end for him.. I really wanted to help him but it was as if he didn't want my help. And whenever I told him, he could do it, it just needed a little effort, he always told me, "Saya bukan budak pandai.."
I'm not proud of myself, but yes, towards his PMR, I realized that in not wanting to feel so frustrated, I sometimes avoided him. But he didn't care, in fact he happily enjoyed it with an 'in-your-face' attitude that made me sadder. I felt as if he hated me. Its not that I singled him out, other students were worse than him in maths, but I felt as if he didn't even wanna try. When the results came out, I didn't even think of him, rather thought of the other students whom I decided WANTED to at least try to succeed. Fast forward to last month..
A new student came into my already crowded class (takde la crowded sangat, I just don't like large classes hehe..). When he wrote his name in the attendance, as usual, I wanted to comment on the fact that we had the same name but something stopped me as the name looked VERY familiar.. but the owner of the name didn't. The feeling bugged me until the next day when it finally clicked.. OMG! I know him!! Gone was the chubby boy and in his place was a bespectacled tall guy, half his previous size (btw, ape la rahsia dia ek.. nak tau gak heheh..). Part of me went, "O-oh! Not him again.." but another part of me who knew it was very bad of me to think like that scolded the first part of me. He still looked like he lacked confidence and I was still unsure if he hates me or not.. In class, he's a different guy now. He's more quiet and he actually LISTENS to me. And on one fine day, he raised his hand TO ASK ME A QUESTION. But I was also suddenly so ashamed of myself..
Then last Sunday, I had handed out some extra questions for students who wanted them and though he also wanted the extra questions, I was still a bit wary with what he'd do with the questions.. I know, this is something a teacher SHOULD NEVER FEEL! I feel so bongok giler now! And yesterday, which is MONDAY, just one day after I gave out the extra questions, he came in and almost shyly handed in his answer script.. when NO ONE ELSE in the class gave me theirs (I had told them to pass those questions to me whenever they wanted to). I'm sure my mouth dropped right on the floor then.. but I continued with the lesson. Back home, without taking of my hijab, I 'attacked' his answer sheet and I came out SMILING & LAUGHING HAPPILY when I realized he had answered EVERY SINGLE QUESTION (some of them just submit the answers to a few questions.. which I don't mind since it was the extra exercise). There were still a couple of mistakes BUT HE TRIED.. and his total marks were somewhere around 95%. I sat back in wonder.. and once again felt ashamed. I had given up on him the previous year and yet he still came to me for this class. I had let him down when, for all I know, his 'in-your-face' attitude was a plea for help, a cry for his teacher to understand him. I'm a BAD, BAD teacher.. whatever made me think I could try to be a good one, huh? I sat there looking at his answers for a long time.. then I wrote a note for him on his answer sheet. Seeking redemption and forgiveness.. and hoping he understood that yesterday, he taught me a very valuable lesson.. DON'T GIVE UP ON THE PEOPLE WHO DEPEND ON YOU! I want him to know that I NOW believe in him.. as I should have when he was in form 3. I want him to know that I'm sorry for giving up on him and for letting him down when he must have needed me the most.. and most of all, I want him to know that yesterday, I was the student, him the teacher..
To Asyraf Ikhwan, saya mintak maaf! :( Sebab awak, saya janji akan cube untuk tak putus asa dengan student² saya.. Thanx sangat² sebab jadi cikgu saya semalam! This school break, I'm having two classes. I was supposed to have my usual form 5 class in Parit Buntar but the teacher for Jawi had to go to Ipoh AND those student, in a fit to bully me (maybe because I always tell them, "Cikgu korang tak sayang kat korang, sebab tu dia asyik ilang je..", to which they always reply, "Maknenye cikgu sayang kitorang la ye?" Aiseyyyy..) had asked for me.. cehh! Tau what one student told me when I first came back to the class..
"Kan padan muke cikgu.. dah kene tengok muke kitorg hari²!!" Anyway, eventhough I've taught for almost 6 years, this is only the third year I'm teaching for the school break and I usually love these school break classes as the majority of the students who come really wanna learn. I remember my first class two years ago. I only had about 20 students I think.. ke tak sampai 20 ek? Ntah, dah lupe.. but I loved that class. I'm sure I've written a lot about them in my blog during that time.. you know, the one with Aiman (Bukan Aiman Kautsar tau :p) who told me, "Klau tak kawen umor 26, nampak sangat dah takde harapan!".. and I WAS 26 then hahah..
That class had this pair of unidentical twin.. and they really were NOT identical. Nak kate adik beradik pun I'll think twice.. Hana and Hani, ingat lagi hehe.. ape la citer diorg ni sekarang? The only one of them yg I saw recently was Nabil when he worked at Shell Pt Buntar during the SPM break. I love this class as I felt as if they were all my younger siblings. Asyik gelak je ngan gelagat diorang, not that we didn't do any learning. We managed to finish 5-6 chapters during that 6-week course. I guess, I really DO prefer small classes..
Then last year was my second class. I had a lot of my 'old students' in this class so it was kinda fun.. though they knew too much about me haha.. more than I would've liked la kot. We didn't manage to finish as much chapters as I did during the previous school-break class but the class was relaxing for me.. though a bit larger than usual. I had around 25 students kot. Not much for most teachers, but a tad too much for me. Still, we had our moments.. and those students still keep in touch with me till now :) I still feel weird when someone calls me 'cikgu' or 'teacher' whenever I'm shopping at the local supermarket or pasar malam but its grown a bit on me. And hey, now I remember, this was among the first classes to call me 'cikgu/teacher'.. my previous classes mostly call me 'kak Ayu'.. much to the annoyance of Cikgu Arun, my 'boss' haha.. This year, I'm getting a bit overwhelmed. My actual class in Parit Buntar has 40 students.. and since I prefer smaller classes, I don't really look forward to this class haha.. adeh! Teruk la Ayu ni.. Most of them are okay.. ade la biase tu budak² yang suke main². But then, ade gak this group of boys who think they're sooo cool, nyampah pun ade! One of them had written this four-letter word in his book, but I doubt he knows the meaning of it. Thats why la I nyampah skit hehe.. even when I call for attendance, he'd raise his hand while giving the finger.. granted la he doesn't actually give the 'right' finger, but I know what he means la, especially when the group of them laughs, thinking its funny. Mostly, I just ignore those rude gestures.. tapi ade mase, sakit ati gak la kot..
Then, earlier in this class was this boy who always sang to me haha.. at first, I thought it was funny. But then it got weirder bile dia mule tanye soklan pelik² and buat bende pelik².. Hahah, ingat saya tak takut ke? Budak form 5 pun.. For a while, phobia jugak la bile budak ni asyik nak tanye soklan je haha.. luckily, he only came for the first two weeks je. Hahah, nampak sangat Ayu ni penakut kan hehe.. The 'accidental' class plak I have around 30 students. Frankly, I like them more. As usual, ade budak yang rajin, ade yang suke memain.. but this type of memain tak de la menakutkan cam the other class. They are mostly acting as 17-year-olds should act la.. and their idea of joking masih bleh diterima la wpun Ayu terpakse menahan diri dari berleter ngn diorg nih.. at least with this class, I feel like I'm teaching my own brothers and sisters. Question is, did I manage to teach them anything at all this school break? I'd hate to know I didn't.. Guess, eventhough I've taught for that long, rase tak konpiden still ade laaa.. I wanna be like Cikgu Nooriah, who made me see the wonder of numbers and made me realize, it wasn't too late for me.. but am I even remotely like her? The Power of Google, eh? I didn't actually plan to do an entry for today. Nak relax skit, had a class this morning then will be having another one in the afternoon. And since its a Sunday, ingat nak bermalas-malasan je di rumah hehe.. But then, just HAD to go online kan.. and noticed a new comment in my blog FROM MY STUDENT. His answer when I asked him how he found me: Di hujung jari je..
Haha.. ye la tu, Zarul! So sekarang sudah terase bahaye Google.. anyone can find me so I'd better behave in my blog. Actually, I don't mind. Closest example; found an old friend when he Googled his own name and also being found out by my student haha.. tp ade masenye tak suke jugak. Like I said earlier, for the not-actually-friends, I hate it when they do that. And klau buat pun, keep it to yourself laaaa.. I know la, my blog is like an online diary sometimes so kadang tu even my dirty laundry is out in the open, but thats me.. so live with it! Utk Zarul: Huh, konpem pasni takde entry pasal kelas korang haha.. baru nak buh satu entry 'bahaye', tak jadik trus hahah..
And utk Zarul gak.. lyrics for I'd Lie :) Sok amik lagu ni tau.. then try to figure out nape akak ckp 'tingat kisah dolu²' through this song tau heheh..
Quick entry.. and the realization its a small world after all hehe.. There were so many things I wanted to update about, starting from Isyam's wedding last Saturday to me, searching for extra questions for my students.. a whole lot more in between! Tp sedang agak busy, I haven't even been bloghopping for the last week, and thats NOT NORMAL for me as most of you know hahah..
And oooohh, I almost had a heart attack earlier this week haha.. okay, I'm exagerrating here but you get the picture. A few entries ago, I was fuming on someone who purposely googled my name.. creepily! I don't mind it when my friends do it, but I hate it when not-actually-friends do it (and that reminds me: Dey! I told you to berambus.. so berambus laaa!). Anyway, someone added me to his YM, and the 'welcoming note' sent shivers to my spine as only one person had ever called me that name (and I actually had kutuk him in my blog about it a few hundred entries ago hahah..).. trying my best to pretend I'm confused, I finally laughed out loud when I realized who the person was hahah.. and to think he found me by googling HIS OWN NAME! So remind me next time: NEVER name names in my blog EVER AGAIN! Hahah..
To Hairil, I actually seldom la name names in my blog.. cam, ne la leh terlepas pandang ek yg tu hahah..
And another quick one (Ceh, quick one kunun, cam panjang jek entry nih! ), going to Abah's on raya morning, Izati was searching through Abah's laptop for some songs (Yes, apparently my ancient father knows how to download songs from the net.. something his daughters pun tak baper nak tau!) and usually I ignore her. But this time, I practically shrieked in delight when I found some old songs I really love :) Ape lagik, curik le MP3 nye dari Abah hehe.. Tried to find it on imeem.com but only got this version of the song, currently on my playlist.. tak bes as the original tapi bleh la for you guys to listen to.. 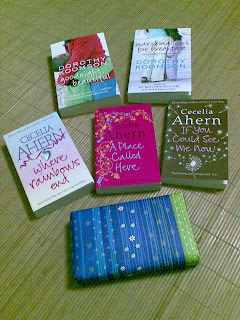 Yesterday got another parcel.. and my books have arrived.. yeay! Sangat suke.. I now have a weeks worth of reading materials :):):) Tu tak campur lagi 2 Stephen King books I bought at Chowrasta the other day.. yeay!! Bleh berenang dlm buku heheh..
A simple 'Thank You' would be enough.. This entry is not for the want of an entry pun.. just felt like writing. I came early to school today, but even if its 10.47am now, I'm still feeling lazy.. which is NOT unusual for me hehe.. Abg Fadzil had arrived before me (He had to send his daughter to school today since kak Nor had a volleyball coach course in Bagan Serai). Then when Ramadhan arrived, we went to have drinks at the cafe. 2. My friend had called at 5.30am and since I knew I couldn't sleep after being awoken at that time, I thought, "What the heck.. this would be better than tossing and turning anyway!" 3. I was curious on the 'incident that had happened' to this person that needed help.. Truth is, before this, I kinda admired this person. I might have developed a tiny crush on him too hahah.. (Read: MBC) Not that I know him that much in person, but I know quite a little bit of a little much about him. Academically, he's a role model. Skipped his MSc and went straight to PhD.. and locally, that is very RARE! You need to graduate with a CGPA of more than 3.50 to be able to that here, not like those who do it Mphile (Betoi ka ejaaaa...!) overseas. Abg Fadzil, when I told him of the incident, said the problem with me is that while I don't expect actual things in return whenever I do something, I always hope for people to say 'Thank You' or 'Sorry' depending on the situation (The 'sorry' thing he was referring to my exhousemate and another thing I'm supposed to forget so I'd rather not write here..), thus, why I was annoyed at this person not saying 'Thank you' even though it never crossed my mind to ask him to cough out the money for toll and petrol (the 'help' included these thingeys!). Choong said some people think they are above other people, so maybe that was why there was no thank you.. which I wholly agree! Abg Fadzil then, after realizing WHOM I was talking about (and claiming, "Dr tu baik laa, Ayu!") said something like, maybe because this person thought he was a catch (Well, I know people HAVE been talking about him haha..) that he thinks he shouldn't interact with any girl who is single, just in case she is 'swept by her feet' with his voice.. yuck! Like I said, the crush was short lived so no worries there.. and still, he owes me a thank you! After that, I've seen him a few times at the cafe and each time, I pretend to not see him, as opposed to buat biase je, this time, I REALLY avoid any glances towards him. Make sure I don't look his way as opposed to the usual people watching we all do in crowded places haha.. Anyway, fast forward to now. At the cafeteria, I saw him coming my way.. NOT my way laaa, what I mean is the same direction as I was going to so as usual, pretended I had no business to look his way. Hey, klau nak rase handsome, gi la perasan sensorang, Ayu malas nak layan! But as I am an unlucky person, I realized I had sat facing him (different table la tapi..) and was too late to change my seat as I didn't want it to be so obvious.. ye la, I pun tak mo gak org tunjuk sgt tak suke kan huhu..
Then on the way back, abg Fadzil commented, "Mane Ayu punye Dr ni? Tadi ade.."
I scowled to him, knowing who he was talking about and pretended I didn't understand and told him Dr Farhan was in KL. Then he told me, he had actually seen the said person coming up to me (must be during the time I saw him coming my way kot!) as if wanting to say something but since I had ignored him, he stopped. Nape, terkejut yang in this world, there is a single girl who'd avoid him ke? They also told me, they noticed him trying to catch my attention but I was avoiding looking at his direction so much that they pitied him.. huh!! Kate abg Fadzil, that means there still a bit of good inside of him since he must've realized he didn't say thank you. He even said, "Hang ni yang berlagak sekarang tau dak!" Still, note to self: Make sure you say thank you or sorry right after it should be said! This morning I taught Cikgu Thiru's form 3 class as he had a whole week course somewhere. His Monday to Wednesday class was taken by another teacher so I was only asked to take his Thursday class. Actually, I don't think I taught much, just showed them how to find the median when the set of data is in a table.. yup, simple for most of us, kan, but maybe diorg ni konpius skit je. Baru blaja kaaannn.. Towards the end of the class..
Student: "Cikgu, cikgu ajar sekolah mane?" I usually hate answering this question as it makes me feel like I'm a fake teacher.. as opposed to their real teachers! Student: "Kami nak pindah sekolah cikgu lah.. bes!" Hahahah.. dan Ayu tersenyum sorang² lagi heheh..
You know you've been taking to much tinned Nescafe when.. There's a new grocery store in Taman Pekaka. Hmm, ok, its not really THAT new, around 4-5 month I think, but you get the picture. Anyway, I usually go to Muaz or AM/PM or 7-11 when I wanna buy anything as this new store is at the new shop lots.. jauh skit dari kedai² lain kan. So I've only been there, say, 3-4 times only. So imagine my suprise when I went there this morning and the apek (Okay la, a bit young and smartly dressed to be called apek la..) smiled and said to me, "Sorry dik, takde stock.."
Knowing there was no one else in the store, I realized he was talking to me. I was a bit confused until I noticed that I was about to grab the Original flavoured tinned Nescafe. "Latte takde la adik.. saya sudah pesan tapi blum ada stok.. Soli ahhh!!" Hmm.. maybe I should cut down on the Nescafe, huh! !